EAST RUTHERFORD, N.J. -- The Houston Texans were trailing late and facing a second straight loss after a nine-game winning streak. "I wouldn't want any other quarterback in this entire universe other than him," Hopkins said. "The things he can do, staying in the pocket after taking hits and deliver balls on the money -- not a lot of quarterbacks can do that." Ka'imi Fairbairn's 40-yard field goal -- his fifth kick of the game -- made it 29-22 with 54 seconds left. Darnold and the Jets (4-10) had one more opportunity to try to tie -or win- but Houston held on. On third-and-10 from the 19, Darnold took off for 14 yards -- and a holding call on Aaron Colvin put the ball on the 2. After Darnold was stopped for no gain on a quarterback draw, he handed the ball to McGuire who pushed up the middle -- surrounded by a surging mass of blockers who helped shove him all the way into the end zone for the score. With New York trailing 16-3, Darnold gave the Jets some life just before halftime with a terrific drive during which he made plays with his legs -- a 10-yard run on third-and-3 -- and arm -- passes of 16 yards to Chris Herndon and 26 to Anderson. On first-and-goal from the 5, Darnold scrambled a bit before stepping up in the pocket and zipping a pass to Anderson for a touchdown to make it a 16-9 game. But, Jason Myers then missed his second extra point of the season -- and 14th of his career. 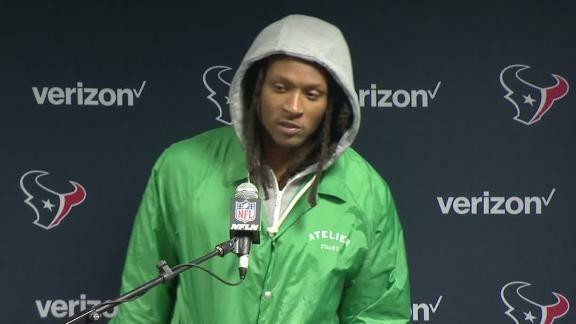 DeAndre Hopkins discusses his two touchdowns saying Deshaun Watson threw it up and gave him an opportunity on both. He also addresses rolling his ankle.